Precise Repetition Training: The Attack II volleyball machine, designed for the women’s game, will deliver thousands of reps in daily practice of serve receiving, digging and spiking. With two extra-wide throwing wheels, accuracy and repeatability are assured in every drill, eliminating time wasting errant hits. Ball wear is extremely limited due to the two 4″ soft white polyurethane ball gripping surfaces and the contoured shape of the ball throwing wheels that uniformly distribute the contact forces, eliminating the high wear contact points. 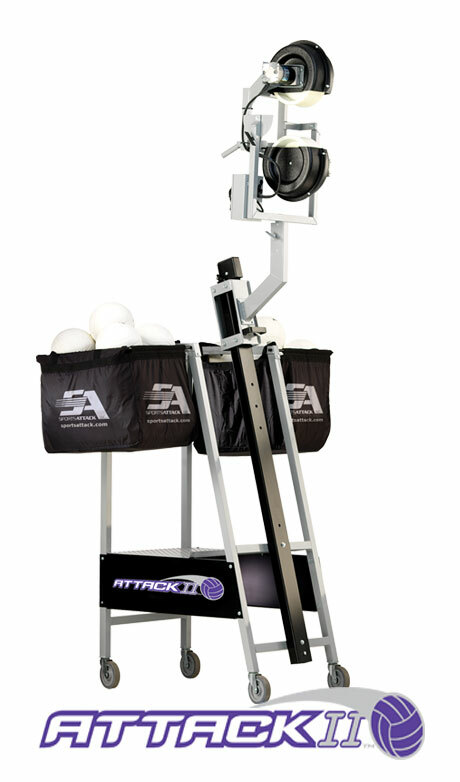 The Attack II can be safely operated by any assistant coach, player, student or parent. This frees the coach to be by the receiving players to teach proper mechanics effectively. No more yelling across the court. It also allows the coach to improve the quality of standard drills and to create new machine drills for every phase of the game. The Attack II platform has a 16-gauge diamond plate, non-slip surface for sure-footing and safety during use. The frame of the Attack II is powder-coated, rust-resistant steel tubing for extreme durability. The extra-wide base of the Attack II machine assures real stability. As the throwing head is raised, it moves towards center of gravity, further insuring stability. Two powerful variable speed motors directly drive two indestructible 4″ wide ball throwing wheels. Rapid recovery provides rapid repetition, no waiting for air-powered launch system to recover.